Starting in January, King County health officials will roll out a long-anticipated public-grading system that rates restaurants based on an aggregate score of four recent health inspections. Local diners can vote on proposed signs through Thursday. It’s taken nearly two years, but King County restaurants will soon start posting storefront signs that display their health-inspection status at a glance, giving diners a new view into food safety. Exactly what those signs will say, however, is still up to the public to decide. Starting in January, officials with Public Health — Seattle & King County plan to roll out a long-anticipated public grading system that rates restaurants based on an aggregate score of four recent inspections. Depending on the results, a restaurant may be ranked excellent, good, fair or needs improvement on signs that could feature smiley-face emoji in shades of green and yellow. Local diners can vote on six variations of the placards online by Thursday, Nov. 17. Go here to vote. Elias and her crew originally thought a restaurant-grading system could be in place by the start of 2015, but it took longer than anticipated to get it right, she said. Local health officials overhauled the system that regularly sends 55 inspectors to review more than 11,000 permanent food businesses and an additional 3,000 temporary sites in King County. With the help of Daniel E. Ho, a Stanford University law professor who has studied restaurant-rating programs extensively, they refined and standardized the way inspectors make decisions and then came up with placards to convey that information to the public. Throughout the process, they sought out opinions from everyone involved, including restaurant owners and food-safety advocates. Such collaboration was appreciated, said Patrick Yearout, director of recruiting and training for Ivar’s restaurant company, which operates 25 sites in King County. Health officials were aware of the impact public signs could have on a restaurant’s bottom line, said Elias. At the same time, there was a clear need to replace the county’s inspection website, which was difficult to search and hard to understand. Coming up with such a system was challenging, however. Simple A-B-C scores used in some cities often don’t distinguish between risky and routine violations. Signs that declare “passed” or “failed” don’t convey the gradations of risk, said Hilary Karasz, a spokeswoman for the health agency. The King County grading system will reflect how a restaurant scored in critical areas such as properly controlling food temperatures and using safe serving practices. Inspectors use a point system in which zero is perfect and a restaurant can be closed if it amasses 90 points or more. However, there’s no frowny-face emoji on the new signs, which are based on the assumption that a restaurant has met basic standards to remain open, Elias explained. “If it’s yucky, why isn’t it closed?” she said. 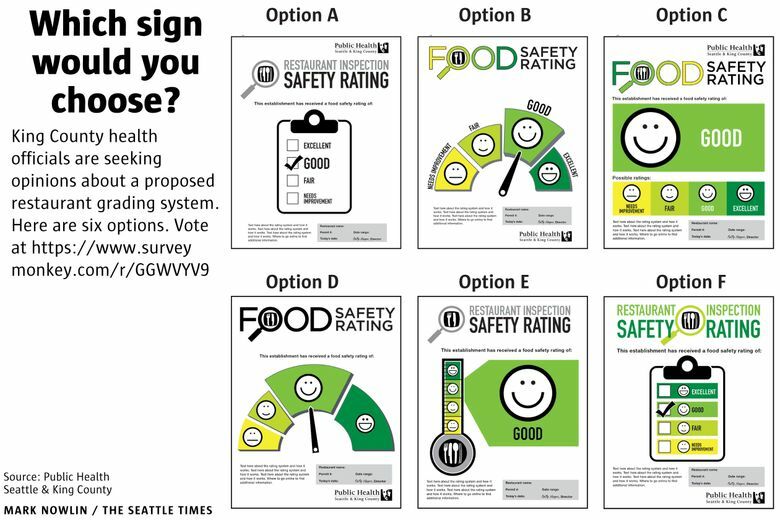 Food-safety advocates said they’re pleased that King County is unveiling a new ratings system, but they’re not enthusiastic about the smiley-face signs. Sarah Schacht, 37, of Seattle, is a two-time victim of E. coli food poisoning who has been lobbying the county to help warn consumers about restaurants with unsatisfactory inspections. She’d prefer to see numeric scores on the new signs, not just emoji. Doug Powell, a former Kansas State University food scientist who runs the food-safety site, barfblog.com, said the proposed King County signs “all seem too busy.” If he had to choose, however, he’d choose options B or D, he said. “At least they are asking people, which is good,” he added. Yearout, of Ivar’s, also favors option B, which displays a range of emoji arrayed along a dial. He’s colorblind, however, so the hues that progress from yellow to deep green wouldn’t be a good cue for him or others with the condition. The ultimate goal is to help prevent cases of foodborne illness such as the E. coli O157: H7 that struck Schacht first as a child, when she was part of the notorious Jack-in-the-Box hamburger outbreak of 1993 and again in 2013, after she ate at a Seattle Ethiopian restaurant that has since been closed.